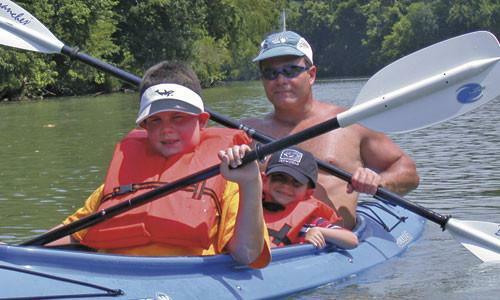 Bastrop on the Map for Tourists :: Bastrop Lawn & Tree Co.
John Cline, co-owner of Rising Phoenix Adventures, offers kayaking tours in Bastrop through Hyatt Regency Lost Pines Resort and Spa. Susan Wendel, president of the Bastrop Chamber of Commerce remembers a time when Bastrop only saw a large influx of tourists during spring break, summer and Christmas. But eventually the tourists went home and Bastrop would ease back into its small-town pace. Something changed, though, in 2004 when tourism activity didn't die down and the small town about 30 miles east of Austin began to see a steady stream of visitors. Then, in June 2006, that activity surged when Hyatt Regency Lost Pines Resort and Spa opened its doors. Hyatt Lost Pines is a 656-acre resort that includes eight restaurants, a spa, and several other high-end amenities that the city of Bastrop hadn't seen before. At the time of its ground breaking, many wondered if Bastrop would have enough demand to populate the hotel. Donna Butler, director of public relations at Hyatt Lost Pines, says the hotel has continually seen a solid number of guests. Butler says the hotel's proximity to the airport and the draw of Bastrop as a historic town have added to the hotel's high occupancy levels. According to the Office of the Governor's Economic Development and Tourism Regional Hotel Reports, Bastrop County's hotel occupancy rate has risen from 45.9 percent in 2002 to 52.7 percent in 2006 with the addition of two new hotels -- an indicator of how well the tourism industry in Bastrop is doing. In 2006, Hyatt Lost Pines alone added nearly 500 rooms to the county's total available. Additionally, total spending in Bastrop County has risen steadily every year since 2002 also according to the Office of the Governor's Economic Development and Tourism's research statistics. The increase in tourism is trickling down to other industries in Bastrop County as well. Denise Rodgers, co-founder of Rising Phoenix Adventures, a local kayak, bike and camping outfitter in Bastrop, estimates giving more than 1,500 people river tours in 2006, an increase of 75 percent from 2005. Since the inception of Rising Phoenix in June of 2005, it has continually expanded its tours beyond basic kayak and canoe trips. Rising Phoenix now also offers guided river trips, training for unguided trips, bike rental, sales and repair, camping supplies and guided fishing trips. Because of the continued increase in demand, Rising Phoenix moved into a larger building earlier this year. "We get overflow business from what McKinney Roughs can't handle for the Hyatt," Rodgers says. Accordingly, the restaurant business in Bastrop is also thriving. While Terri Knop, owner of Baxter's in the historic downtown district, saw a steady increase in business before Hyatt Lost Pines came to town, in recent months the restaurant has had to renovate and expand to accommodate even more business. Baxter's is in the midst of adding an upscale wine bar. "Our business has doubled since the Hyatt came to town and I'm seeing new faces from all over the country year-round now," says Knop. community development director. Elgin also has two Christmas tree farms that host seasonal activities, a considerable brick manufacturing plant that offers tours, great cycling trails and City Café, which Miller says has been listed in the Top 10 for both their chicken and dumplings and desserts. "We have a diverse art community in our historic downtown district, which was recently named a Texas Main Street City, with nice restaurants, bookstores and even free Wi-Fi," Miller says. Both Bastrop and Elgin are proud to have been designated Texas Main Street cities by the Texas Main Street Program, which is a part of the Texas Historical Commission's Community Heritage Development Division. The program recognizes cities in Texas with historic downtown areas and commercial districts then helps them to revitalize the areas. According to the program's Web site it has "resulted in the private reinvestment of more than $860 million in Texas downtowns and neighborhood commercial districts, the creation of more than 18,200 jobs and the establishment of more than 4,600 new businesses." In addition to the river, park and events in Bastrop, many come to tour the more than 130 nationally registered historic homes and buildings in the town, the petting zoo, the car museum and opera house. November for our classic car show and, in October, we had approximately 3,500 people in costume in our downtown district for Halloween," Wendel says.